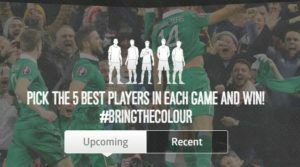 ELVERYS EURO 2016 FANTASY FOOTBALL! Euro 2016 is upon us at long last and Elverys Intersport are getting involved with an amazing competition! Not only are we giving you the chance for some extra excitement during Ireland’s three group games with our cracking Fantasy Football game, but, with thanks to our good friends at Umbro Ireland, the top scorer in for each Irish match on our Fantasy game will win a Irish jersey SIGNED BY THE ENTIRE 2016 SQUAD!! Yes indeed – just sign up to our Euro 2016 Fantasy Football game, follow the simple instructions, pick the players who you think will get you the most points, and you could win a jersey signed by the boys in green!! It’s that simple! Runners up prizes will include the adidas Euro 2016 Official Match Ball and much more! !